Daminion is a multi-user, easy-to-use digital photo and document management solution for your precious multimedia content. Easy asset cataloging means goodbye to last-minute scrambling. Daminion also supports storage of data inside files, including copyright information, synchronization of database information with EXIF, IPTC, XMP, and MWG, as well as format-specific metadata in a wide variety of formats. The metadata mark your copyrighted material; this helps to protect your intellectual property rights. Daminion supports a wide variety of media formats, including raster, vector, camera RAW images, video, music and PDF files. Your library remains portable: catalogs contain relative file paths. That means you can easily move a folder with media files and the catalog to a new location. Multiple catalogs can be opened in separate tabs simultaneously in modern web browsers. You can work with Shared and Local catalogs in the same workspace as well. The program's export feature supports optimization on demand; users can export media files with specific conversion rules. In one click your files can be optimized for uploading to Flickr or Facebook. Convert files on demand without redundant file duplicates or different image sizes and formats. 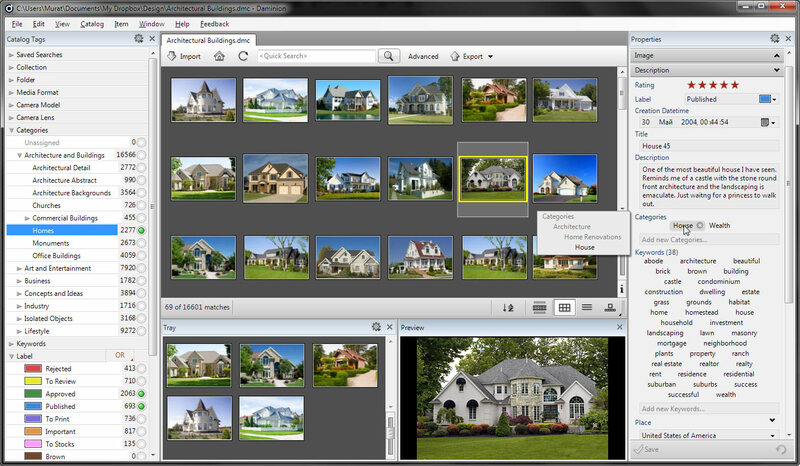 Daminion is a full-featured digital asset management solution that will help you get the most out of your assets. Catalog it, move it, share it and do everything else you need, all from within Daminion. Know where your content is - and then put it to work! Recent Changes: Daminion 4.5 provides access to a server-based media database via a web-client. A new File Watching Service feature drastically reduces Server PC load and immediately reflects changes made to outside files. The Daminion update keeps track of when and where assets are used and who is using them. IconLover 5.45: Icon editor to make icons, manage icon collections. Made with love! Fast RM to MP3 Converter 4.2.587: Convert RM, RA, RAM, RMVB, to WAV, MP3, OGG, APE or WMA Abex PDF to Flash Converter 3.9: It is easy-to-use and provides the best way to convert PDF to SWF flash A-PDF Watermark 6.4: Add manipulate watermarks to Acrobat PDF documents.